Cape Cod, MA – For many New Englanders, the weekend before Memorial Day is just another weekend leading into summer. However, for those who are participating in the annual Cheeky Schoolie Tournament, it’s a weekend that’s long been circled, highlighted, and underlined on the calendar. Now the largest fly fishing tournament in the world, the Cheeky Schoolie Tournament is a low barrier to entry, grass roots style event designed to encourage the interest and growth of saltwater fly fishing, and to welcome the hard working schoolie striped bass to their summer vacation home on Cape Cod. The event is unique because it is a wade fishing only, catch and release only, teams of two tournament. In its 7th year, the annual Cheeky Schoolie Tournament sold out within a record 24 hours and a waitlist was created to accommodate as many participants as possible. 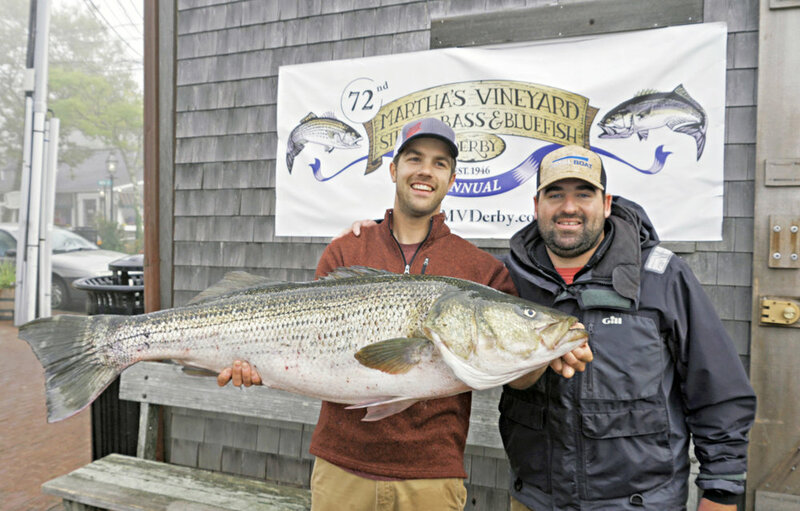 This year’s event was the tournament’s largest, with over 430 fly fishing anglers from all over the world descending on Cape Cod for a weekend of striped bass fishing. Under the early light of a rising sun, and the somewhat unexpectedly decent morning weather conditions, competitors started to file into the West Dennis Beach parking lot beginning at 5am. To most, it felt like Christmas morning and the lack of sleep had little to no effect. For others, the provided Red Bull and Bobo’s breakfast bars were a welcomed site. Teams of two lined up to officially check in and receive their tournament issued Photo Puck and Tape Measure. At 6am sharp, Cheeky Co-Founder and CEO Ted Upton climbed to the top of the tournament truck to broadcast the official rules. And with that, the 7th annual Cheeky Schoolie Tournament was officially under way with teams racing to their vehicles and off to their first fishing spots. Despite forecasts, the weather cooperated quite nicely throughout the morning. As the day wore on, the tournament unfolded on the #CheekySchoolieTourney hashtag. Dozens of schoolie stripers were becoming Insta-famous, and even a few big fish too. Teams recorded their day posting mad dashes to secrete spots, personal best catches, and also oddities like @troutandtravel's run in with a sea robin, which was good to take home this year’s Social Media Award. When it was all said and done, a record 9,000+ cumulative inches of striped bass were caught and released in the 2018 tournament. There was certainly no shortage of fish. This year’s average recorded score was an all time highest 73”, making the battle for a podium spot all the more challenging. With 216 teams all gunning for the top spot, at the end of the day, there could only be three teams on the Dale’s Pale Ale 12-Pack Podium. Team Wicked Nauset took home 3rd place with 99.50”. Team SANDSTORM secured 2nd place with 100.25”. And without further ado, this year’s 2018 Cheeky Schoolie Tournament champion was Team Buzzards Bay Outfitters, who took home the gold with an impressive 103.25”. Striper fishing has been slow in this year’s Derby. With three days left in the five-week tourney, not one shore bass has cracked the 30-pound mark. Boats have fared little better, guides have been grumbling and fishermen have been scratching their heads with eel-slimed hands. But on Saturday, Stephen Hansel of Tiverton, R.I., landed a 51-pound striper, fishing with close friend Jamie Simmons. The beefy 48-inch fish put him atop the leaderboard, and put he and Jamie in first place in the team competition. It’s been a good week for Stephen. Two days ago, he weighed in his first albie, giving him the Grand Slam and rocketing him into first place, with a commanding 10-pound lead. “It’s what you dream about when you fish the Derby,” he told The Times. Stephen said they were fishing with eels off the Elizabeth Islands, close to slack tide, in about three feet of water, when he hooked up. Stephen said he and Jamie have focused primarily on bass, making for a lot of late nights. “Unless it’s blowing over 25, we’re going fishing,” he said. Both men have day jobs, Stephen at Raytheon and Jamie at Imtra Marine Systems. “When I look like a zombie at the lunch table at work, my friends know I’ve been fishing,” Stephen said. “We’ve gone through a lot of coffee and Red Bull,” Jamie said. Stephen and Jamie have been fishing buddies since their days at the University of Rhode Island, where they would sometimes duck out and fish between, or during, classes. The long hours have paid off. “It’s a fish of a lifetime,” Jamie said.